Postcards from the Attic: Thank You Grandad! 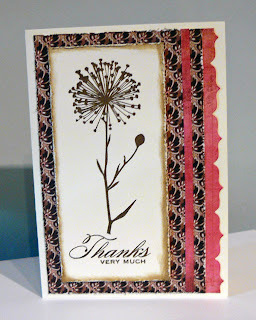 A thank you card I made with a brand new stamp I got for Christmas. I nearly died with excitement when I discovered my tiny local craft shop is selling Hero Arts stamps! Gramps got me a £25 voucher for xmas so guess what I purchased :). I was determined to use them and not leave them un-inked for months so there will be another creation with the second stamp I purchased tomorrow! This started out as based on the sketch from 2 Sketches for You but it changed rather a lot in the process! I'd also like to dedicate this card to my friends Alix, Paula, Ruth and Jaki - you guys have been the best and look forward to loads more fun times in 2010!